An international research project for studying migration routes and wintering areas of the Red-throated Diver with geologgers has been going on for several years. One Finnish female diver was monitored with the aid of a geologger from summer 2014 to summer 2015. This female was the first Finnish Red-throated Diver which has been monitored all over the year. 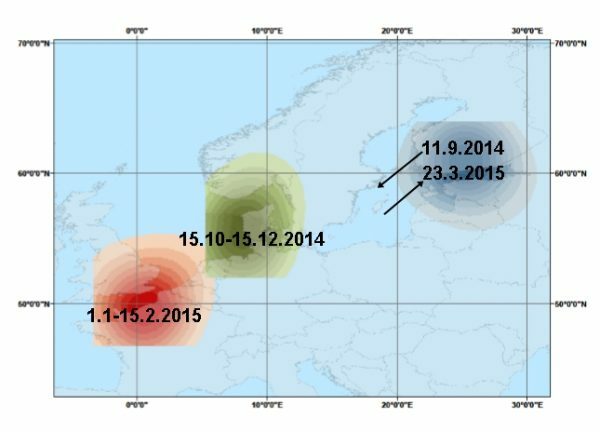 The main staying areas of the Finnish Red-throated Diver female from autumn 2014 to spring 2015. The female was ringed earlier and at least four years old in summer 2014. It was trapped on 21st August 2014 in her nest-site for fitting the geologger. The nest-site situated in Uusimaa, southernmost Finland. The bird started its autumn migration on 11th September. The following day it was already in the middle parts of the Baltic Sea, and on 14thSeptember close to the Danish Straits. From 15th October to 15thDecember the female stayed in a limited area on the German and Danish North Sea, possibly moulting. From the North Sea the bird continued its flight to the English Channel where it stayed from 1st January to 15thFebruary 2015. In spring this female Red-throated Diver migrated much more rapidly than in the previous autumn. The migration flight started in the beginning of Mach, and the bird arrived in the Finnish Baltic Sea already on 23rd March. It started nesting on 8th May in the previous nest-site, but the clutch was destroyed due to disturbance. The female laid a repeat clutch which was successful. The bird was trapped for taking the geologger away for data analysis on 20th July, close to the end of the incubation period. The data showed that this female stayed over the mid-winter on the English Channel, further away than the majority of the earlier winter-time ringing recoveries of the Finnish birds have shown. Winter-time ringing recoveries of the Finnish Red-throated Divers. Green dots = ring recoveries from 5th November to 28th December; red dots = ring recoveries from 15th January to 17th February; red squares & red triangle = photographed divers with darvic rings; green star = a diver drowned in fishing net in Montenegro.